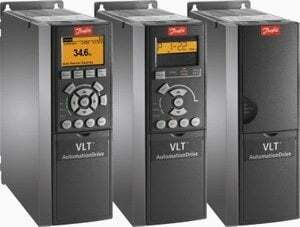 In accordance with accepted practice and the local, power is normally provided to a VSD from a distribution board (DB) or a motor control center (MCC). Adequate arrangements should be made to provide safety isolation switches and short-circuit protection in the connection point to the power supply. The short-circuit protection is required to protect the power cable to the AC converter and the input rectifier bridge at the converter. The converter provides down-stream protection for the motor cable and the motor itself. Adequate safety earthing should also be provided in accordance with the local wiring rules and codes of practice. The metal frames of the AC Converter and the AC motor should be earthed as shown in Figure 8.3 to keep touch potentials within safe limits. The chassis of the AC converter is equipped with one or more protective earth (PE) terminals, which should be connected back to common safety earth bar. 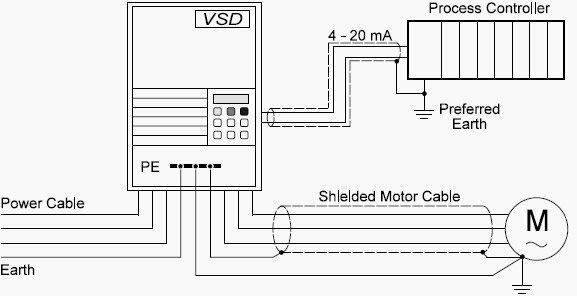 The variable speed drive should be connected to the power supply by means of a cable that is adequate for the current rating of the VSD. Reference can be made to Australian standard AS 3008 when selecting cables. The AC converter requires a 3-phase supply cable (red/white/blue) and a protective earth conductor (green/yellow), which means a 4- core cable with copper or aluminum conductors. A neutral conductor is not necessary and is usually not brought to the frequency converter. The AC converter is a source of harmonic currents that flow back into the low impedance of the power supply system. This conducted harmonic current is carried into other electrical equipment, where it causes additional heat losses and interference. Sensitive electronic instrumentation, such as magnetic flow-meters, thermocouples and other microprocessor based equipment, ideally should not be connected to the same power source, unless via a filtered power supply. Also, interference can be radiated from the power supply cable and coupled into other circuits, so these cables should be routed well away from sensitive control circuits. The power supply cable should preferably be laid in a metal duct or cable ladder and shielded in some way to reduce the radiation of EM fields due to the harmonic currents. Steel wire armored (SWA) cables, are particularly suitable for this purpose. If the power cable is unshielded, control and communications cables should not be located within about 300 mm of the power cable. The conductor sizes should be selected in accordance with normal economic cable selection criteria, which take into account the maximum continuous current rating of the VSD, the short-circuit rating, the length of the cable and the voltage of the power supply system. The relevant local safety regulations should be strictly observed. However, when selecting the cable cross-sectional area for the power supply cables and upstream transformers, a de-rating factor of at least 10% should be included to accommodate the additional heating due to the conducted harmonic currents. If a supply side harmonic filter is fitted at the converter, this may not be necessary. Three phase systems composed of three single-conductor cables should be avoided if possible. Power cables with a trefoil configuration produce a lower radiated EM field. The cable from the AC converter to the motor carries a switched PWM voltage, which is modulated at high frequency by the inverter. This results in a higher level of harmonics than the power supply cable. Harmonic frequencies are in the frequency spectrum of 100 kHz to 1 MHz. The motor cable should preferably be screened or located inside a metal duct. Control and communications cables should not be located close to this cable. The level of radiated EM fields is higher for cables with 3 separate single cores, laid horizontally on a cable ladder, than a trefoil cable with a concentric shield. The recommended size for the cable between the AC converter and the motor should preferably be the same as the power supply cable. It will be easier to add a bypass device in parallel with the frequency converter at a later date, using the same cable, cable lugs and connections. The load-carrying capacity of the motor cable is also reduced by harmonic currents and additionally by the capacitive leakage currents. It should be borne in mind that the AC converter VSD provides short-circuit and overload protection for the cable and motor. A separate earth conductor between the converter and motor is recommended for both safety and noise attenuation. The earth conductor from the motor must be connected back to the PE terminal of the converter and should not be connected back to the distribution board. This will avoid any circulating high frequency currents in the earth system. When armored or shielded cables are used between the converter and motor, it may be necessary to fit a barrier termination gland at the motor end when the cable is longer than about 50 m.
The reason is that the high frequency leakage currents flow from the cable through the shunt capacitance and into the shield. If these currents return via the motor and other parts of the earthing system, the interference is spread over a larger area. It is preferable for the leakage currents to return to the source via the shortest route, which is via the shield itself. The shield or steel wire armor (SWA) should be earthed at both the converter end and to the frame of the motor. The control cables should be provided in accordance with normal local practice. These should have a cross-sectional area of at least 0.5 mm2 for reasonable volt drop performance. The control and communications cables connected to the converter should be shielded to provide protection from EMI. The shields should be earthed at one end only, at a point remote from the converter. As mentioned earlier, both the AC converter and the motor must be provided with a safety earth according to the requirements of local standards. The main purpose of this earthing is to avoid dangerous voltages on exposed metal parts under fault conditions. When designing and installing these earth connections, the requirements for the reduction of EMI should also be achieved with these same earth connections. The main earthing connections of an AC converter are usually arranged as shown below. The PE terminal on the converter should be connected back to the system earth bar, usually located in the distribution board. This connection should provide a low impedance path back to earth. The earth conductor from the AC converter is run in the same duct or cable ladder as other cables, such as control cables and power cables for other equipment. Harmonic currents can be coupled into sensitive circuits. Ideally, instrument cables should be run in separate metal ducts or steel conduit. Running unshielded motor cable next to the supply cable to the AC converter or the power cables for other equipment. High frequency harmonic currents can be coupled into the power cable, which can then be conducted to other sensitive electronic equipment. Other cables should be separated from the motor cable or converter power cable by a minimum of 300 mm. Running excessively long cables between the AC converter and the motor, these should be no longer than 100 m. If longer cables are necessary, motor filters are necessary to reduce the leakage current. Alternatively, the switching frequency may be reduced. You have not just used “Practical Variable Speed Drives and Power Electronics by Malcolm Barnes” as source, you have copied it word for word.